Shower enclosure consists of a hinged door and a fixed wall to which has been another hinged door has been attached. The product is well-suited for a shower corner outside, next to which on the one side are fixtures. Fixed wall can be dimensioned according to the depth of the fixtures so that when opened, the door does not hit the fixtures. The doors can be dimensioned symmetrically or so that the doors are of different sizes. When the shower is not in use, the door can be positioned parallel to the walls of the building. Doors rotate 90 degrees in both directionsand are equipped with adjustable centring. The centring attempts to return the door to the open and closed positions. A magnet seal keeps the door tightly closed during showering. The shower wall and door are attached to the walls of the building from the sides by means of wall mountedprofiles. The fixed wall is supported from the top edge by the brace bar installed in the corner and from the bottom corner by the fitting glued to the floor. There will be a 25mm gap between the panel and the floor of the fixed wall. A seal (standard part) may be installed between the panel and the floor in order to prevent water from flowing under the panel. Floor seals (standard part) which limit the flow of water, can be installed along the bottom edge of the door panel. The profiles mounted to the edges of the panel are manufactured of aluminium. The white (RAL 9010) and black (RAL 9005) surface treatment options are manufactured by powder coating. Grey and glossy are anodized coatings. Profiles are sandblasted before anodization, so that the surface is as smooth as possible and there will be no fingerprints. The fittings used in the product, like square foot and brace bars, are chrome plated brass alloy. The product is manufactured from a 6mm thick clear tempered safety panel (EN 12150). The safety panel can be treated in the factory with a Cranith calcification prevention coating. The coating enables the panel to stay clean easier. The size of the alcove fitting can be selected from among the standard sizes or it can be manufactured custom dimensions. The adjustment range of the wall mountedprofile of the fixed part is 20mm and that of the door, 15mm, respectively. 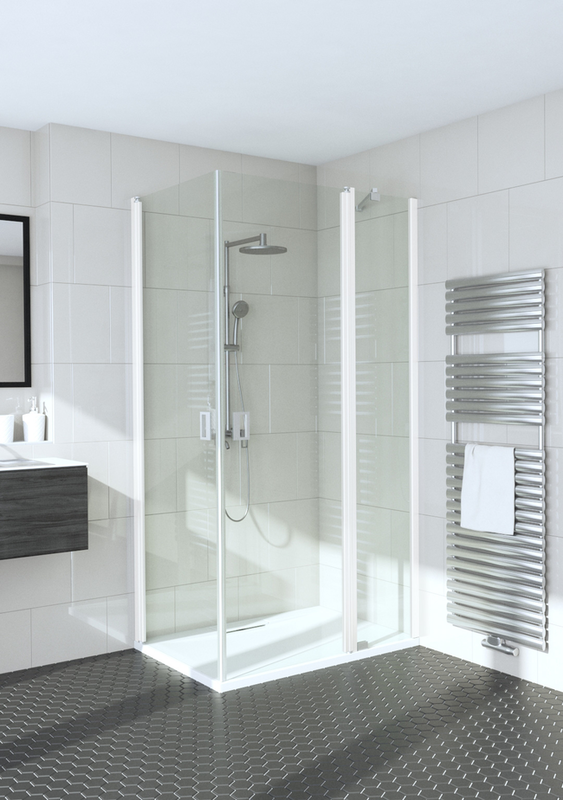 The adjustment range can be used for levelling of any tilt of the building’s walls or for extending the widths of the sides of the shower enclosure in relation to the provided standard dimensions. The widths of one or both sides can be further extended by 34 mm via the extension profile (optional accessory). The extension profile can be grooved, for example, for the inlet of the surface water pipes. Installation dimensions mean the location of the outermost side of the wall mountedprofile on the building wall measured from the corner of the shower area. The width of the side of the wall mountedprofile placed against the building wall is 22mm. 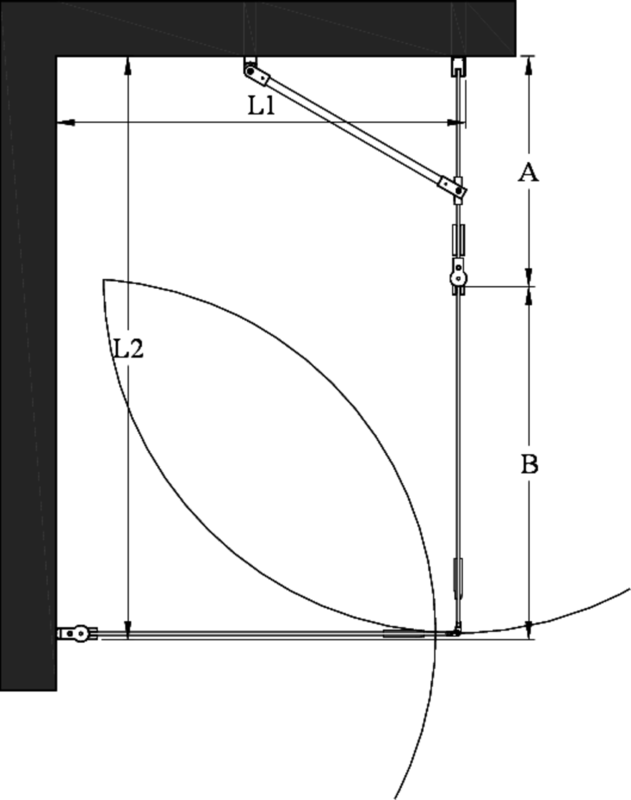 The dimensions may deviate from the declared values if the adjustment range must be used to level the tilt of the walls. Note! The parts of the shower enclosure may also be installed in the opposite direction than presented in the layout.